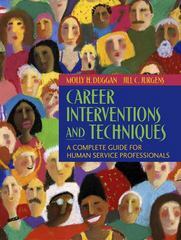 Career Interventions and Techniques 1 Edition This unique text provides detailed information on career development interventions appropriate to use with some of the most common populations with whom entry-level human service professionals often work. This practical and new all-in-one reference includes coverage of the historical perspective of career counseling, career development theories, career assessments, employment campaign, and program development/evaluation. Written for associate- and bachelor-level human service professionals working with diverse populations, this new text allows students to see how to integrate these topics when developing their own personal approach to working with their clients. Twelve chapters provide detailed information on career development interventions appropriate to use with some of the most common populations with whom entry-level human service professionals often work. Each of these chapters includes a case study, a description of the population, barriers to career success, interventions, programs, a career counseling program model, and services specific to the population. Finally, the text also explores special topics pertinent to entry-level human service professionals: ethical issues, workplace issues of the 21st century, maintaining balance, diversity, workplace safety, supervision, and technology.